Here it is!! Our new triplet stroller, complete with three car seats and matching bases for our car — all for the bargain price of just $200!!! Where did we snag this awesome deal, you ask? 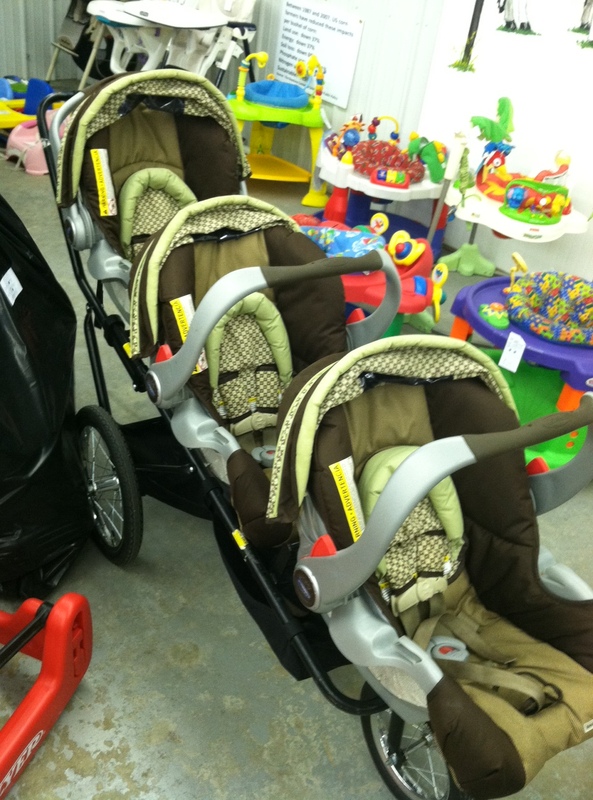 At the Southside Parents of Multiples sale at the Johnson County Fairgrounds this past Saturday!! It was an early morning, no doubt (had to be there at 7 a.m.), but it was well worth it. We weren’t interested in any of the clothes, toys, or other items that we could borrow from singleton parents we know. A triplet stroller is one of those things that no one else will be able to lend us — and we got lucky enough to check off car seats in the process! Keep in mind, this stroller/car seat/base combo would easily run as about $1,000 in stores. While we were there, I also ran into an “old friend” — a Sesame Street baby mobile that I had as a kid. It brought back a lot of memories of watching my sisters and brother play with it as babies too. I “got in trouble” when we got back to my parents because I didn’t buy it (it was only $1), but it was nice just to see it. Is this 80s-tastic or what? As we finished our shopping and wheeled out our stuff, we got our first taste of “triplet stardom” as the line of singleton parents (they weren’t allowed in the sale until 8 a.m. so that the actual multiple moms could shop) stared us down. I heard whispers and things like “oh…..my…..gosh……” It’s too bad I hate unwanted attention, cuz this stroller is certainly a gawk magnet. Either way, we’re so excited about our purchase — mostly just to have our big ticket items checked off. Now how the heck are we gonna steer this thing???? I have the same graco stroller for the twins. 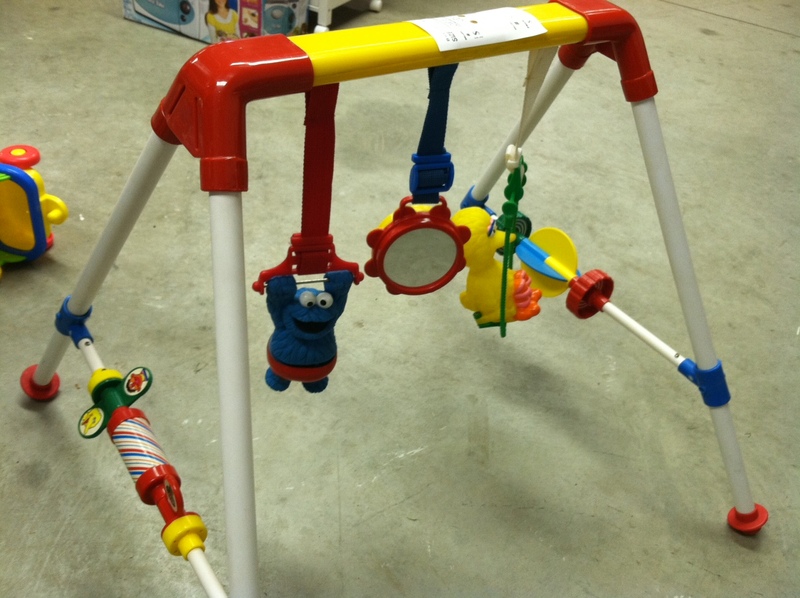 It works great and will grow with them…I believe it holds each baby up to 45lbs. That is awesome you got the car seats with bases with it. $200 is an awesome price. WOO HOOOO! You are doing awesome mama! Great that you found one in good condition. I remember when we were shopping for a Honda Odyssey minivan and we looked at a used one that belonged to a family with children and I thought to myself, “Really…how could they let it get this gross inside?”(and that was cleaned up for prospective buyers!). So I bought a new minivan, then got a baby (that’s “one” baby) and then found out just how quickly kids gunk things up! !